Star Trek Online has been out for over a year now, and I have just finally received my first new ship. You get it as a part of the promotion to Lieutenant Commander. The Light Cruiser was nice and got the job done, but it is always nice to upgrade. Choosing my next ship was not an easy task. I had three choices, Science, Tactical and Engineering. Tactical is not really my thing, so that was out. I actually liked Science and Engineering equally, as they both had nice abilities available for Lieutenant officers. The decision came down to looks, and I think the Engineering ships at this tier look better than their science counterparts. Above is the USS Preston (Bill S. Preston, Esquire I assume) which happened to be the random name given to it. The next big decision was promoting a Bridge Officer to Lieutenant. My current Engineering officer is a pre-order Borg. I'm really not wild about having a Borg on my crew. I didn't like Seven of Nine all that much in Star Trek Voyager either. The problem is, the Borg BO is one of the better ones available in the game. She has a tier three skill called Aceton Field III, which you can't just buy at the Power Store. So I feel compelled to promote her, even if I don't like the idea of a Borg serving on my bridge. Once promoted, I trained her in Reverse Shield Polarity. It is a Lt skill which turns incoming beam damage into shields. Sounds neat to me. 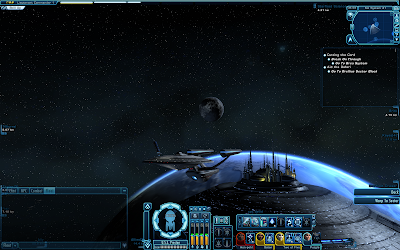 With my new ship all ready to go, I will be tackling the last episode of the Cloaked Intentions Featured Episode. It has been a great series, so I am a bit sad to see it end. On the plus side, one of the rewards is a Reman Science Officer.